Chef’s Table, Main Street, Winfield, Kansas, the year in review and what a year it has been—certainly worth a look back. The Chef’s Table, like most restaurants, was a dream, long before the food was being made. The dream / concept was to bring French Country and Norman Rockwell America, together into a dining experience, in which, the entire environment made patrons feel as though they were with the Chefs as their food was being prepared, or more simply put, in the kitchen, without actually having to be in the kitchen. Of course, for this experience to be as authentic as possible, I (Chef Stan) decided that the first Chef’s Table needed to rise out of the Heartland of America, so after a 4,000 mile drive about, I decided that Small Town, Main Street, U.S.A aka Winfield, Kansas, was as good a spot as any for the first Chef’s Table by Chef Stan! Now Chef Stan, that would be me, is neither an architect, nor contractor, thus the title Chef Stan, but I did know that the Chef’s Table in Winfield needed to be a large open space with, with lots of brick on the outside and wood on the inside. I also knew that there needed to be multiple cooking and dining environments. To this end, we were able to create the first, which we call the café and pantry. The concept of the café and pantry being, casual / affordable fine dining—patrons order at the counter and we bring them their food. I should mention that the pantry, really is our pantry, stocked with more than a 100 types of olive oil and balsamic vinegars, and at least a 150 different spices, all of which we use and offer for sale. With respect to fine dining, it’s no simple task to elevate soups and sandwiches to this category, but I think that we have—in a big way. And our Onion Quiche Lemon Tart combo, is simply one of the best meals in the world! Some years ago, I traveled around and I happened upon a little town. Winfield, Kansas was its name, and Bluegrass Music had brought it fame. You see when Country Music from Appalacia is fused with Jazz, then you see what the music has. It has soul, it has a life that transcends and no one can see where the Bluegrass ends. To Winfield folks come from all around, just to hear that Bluegrass sound. Thousands, maybe ten’s of thousands, camped out in nature among the stages, often forgoing a week of wages, because some things have no price. The formal name of this event, is the Walnut Valley Festival, but everyone from somewhere else just calls it Winfield, and the people of Winfield just call it Bluegrass, and after all what’s in a name, it doesn’t matter having achieved true fame. My first experience at Bluegrass I sat at a campfire and then I walked around, following along with some people from town—they seemed more interested in drinking than listening to music. They say you can lead a horse to water, but you can’t make it drink, true of most people I have come to think. I don’t know which night it was, but it had stormed and it was cold, yet Matt, Skyler and I, sat in the wet bleachers under a dark night sky. Tommy Emanuel played, I had never heard anything like it, and I’ve heard a lot, and I’ve seen a lot, and I’m always thankful for what I’ve got, and that evening I can say, I got Bluegrass. A couple of years gone by, I found myself making my way to Bluegrass with a wedding cake in hand—I had baked it for a friend with a Bluegrass band. Good old Barry Patton had decided to get married to Rene on Stage Five, on these experiences I truly thrive. You see I’m of the belief that life is for living and to get the most out of living, you have to be giving. So I gave my friends a cake. Another year gone by and I was blessed to have my sister and Kasey encamp at my home, which happens to be a place of food and hospitality, really the nicest reality for those of the artistic mentality, such as I. And to those who think as I think, there’s nothing as cool as those on the brink, the brink of greatness. The night at Bluegrass with my sister was a magical night, there’s nothing like your own people to make you feel right. We stopped by the Picking Parlor to here some picking, and the guy on the banjo was world class kicking. On Stage One, we caught John McCutcheon and Steel Wheels, you just have to do this to know how it feels. On Stage Two we listened to The Greencards and Socks in the Frying Pan—not so hard to be a fan. We ended the night with Detour, the air had a chill, but this did not distract from their skill and skill they did have. We walked away from all of these goings on, late in the night, knowing that in the Universe something was right. You see when Country Music from Appalachia is fused with Jazz, then you see what the music has. It has soul, it has a life that transcends, and no one can see where the Bluegrass ends. There was something in the air, something that I feel compelled to share, I’m speaking now of the County Fair. You see I am a man of middle age, seemingly past the County Fair stage, but I did not grow up doing such things, my perspective is that of one raised in the city, dirty, grey and all too gritty. The wind blows the wheat fields, causing a gentle motion, as beautiful a sight as any ocean. Back and forth, to and fro, stand at the break and watch it grow. And it is in this land that you will find Cowley County, a place much blessed with beautiful bounty. Did I just learn that there was something called a County Fair? Why would it take a half of a lifetime to get to one? But who doesn’t have things undone? Maybe this is why my father said he believed in keeping life small, because from this place there’s nowhere to fall. A year gone by now, I moved from a big place, to a small place, at least that’s how it appears on the matter’s face. But I’ve learned in the last year that big is small, this is not discovered in a crystal ball—but by living life. And the small life, the real life, the good life, well it turned out to be larger than I could have ever conceived, it is this life that the Lord is more easily perceived. The quiet, the calm allows one to contemplate Gd. The Ranch Rodeo, night one, who would have thought that wild cow milking was fun? Three cowboys, one cow on the run, and a bottle to fill, fifteen seconds and team Buford was king of the hill. 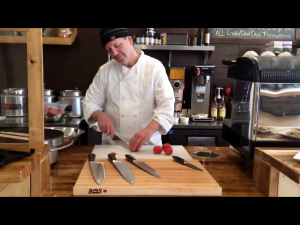 Have you been enjoying the Chef’s Table YouTube Channel? Great! Here are the next two episodes! In Episode Three, we witness how chefs really cook when customers aren’t watching. Chef Stan listens to ‘Let Her Go’ by Passenger as he preps some tomato soup. What happens during prep time will surely make you laugh. In Episode Four, Chef Stan is being spied on again. This time, it’s while he does his morning workout. The life of a chef is a busy one, so a trip to the gym isn’t always the easiest option. Instead, you must improvise. 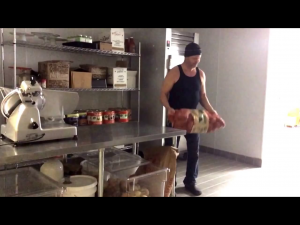 Chef Stan has perfected the art of the Chef’s Secret Workout. I had gone back to my hometown to work hard and try to find myself again, which turned out to be more of a beginning than end. On a whim I opened a place for people to eat, and realized that it was I, I still needed to meet. “Look how happy you make people,” this was said to I, and then came that thought from the sky. I’ve spent my whole life seeking fortune and fame, but not enough of either came. Because there never is enough. Why not just spend your time feeding people and making them happy? So my penitence and personal protest transformed to purpose, and the I that had gone missing began to surface. And in my quest to do things right, the employees and landlord did not delight. The place where I cooked was both loved and hated, people who had not met me said I was not so nice, in the mirror it is they who should look twice.